Everybody loves a good story. Stories about hope. Stories about the underdog. Stories about people coming together in spite of the odds. Stories with unlikely heroes and not-a-minute-too-late miracles. But the stories that stay with us are the ones that we get to be a part of. So, let us invite you to be a part of a story for Melissa Nichols. 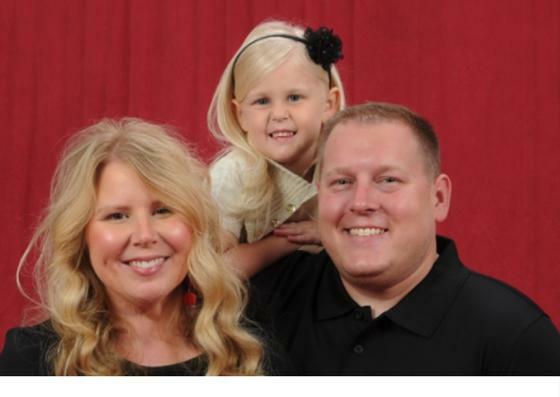 For those of you who don't know the Nichols family, Melissa (35yo), her husband Christian (36yo) and their (4yo) daughter Maggie reside in Katy, Texas. Christian is a School Resource Officer (SRO) in the Lamar School District, as well as a member of the Rosenberg Police Department. Maggie is an adorable, energetic princess who loves to sing, dance and hang out with mom and dad. Many of you know the serious health problems Melissa has been struggling with for well over 10 years. Melissa battles several chronic illnesses, affecting different organs and areas of the body. Most concerning- a tumor and an AVM (Arterio Venous Malformation) in the brain. Complications from this has put pressure on her optic nerve- causing vision loss, excruciating head pain and other debilitating symptoms. With this long list of medical problems to fix, Melissa's recent years have been filled with endless prescriptions, surgeries, physical therapy, infusions, injections, nerve blocks, MRIs and chemo. With the situation becoming more serious and threatening over the last year, it seemed like a last-resort-all-too-risky surgery was the only option left. That is, until after a recent round of chemo and change in treatment finally showed improvement. But years of medical care, the high cost of chemo, treatments not covered by insurance and medical expenses in general have become all too overwhelming. It seems like the long awaited solution has become out of reach because it's unaffordable. But we don't believe that is the end of the story. So, we are turning the page and inviting you to help us write the next chapter. We have started this page to raise $50,000 to cover medical expenses so Melissa can continue the treatment she so desperately needs. We believe this story is not over yet, and we believe that this treatment will help keep hope alive and allow healing to continue to happen for Melissa. This is a story of going up against the odds, up against losing hope and up against a long list of reasons to stop believing in miracles. So help us write a different ending. Send a prayer. Send a donation. Send this on to people you know who want to be a part of the story #nottheend. Part of Melissa's story. Thank you for praying. Thank you for believing. Thank you for giving.